Eventers won’t leave the startbox without them—the super-secure Griptek™ full seat panels (needle-punched and Coolmax-lined for ventilation) keep riders tight in the tack while flattering stretch-woven Dynamic Extreme™ fabric lets them show off fearless riding, but nothing more. Really like these breeches. The small fit perfect (I am a size 4). I also love the light weight material around the ankles - frees me up!! Interesting placement of the zipper; I like the look! The first ride in these breeches may feel a little (just a little) constricted, but after that, they were perfect! I'll buy again! 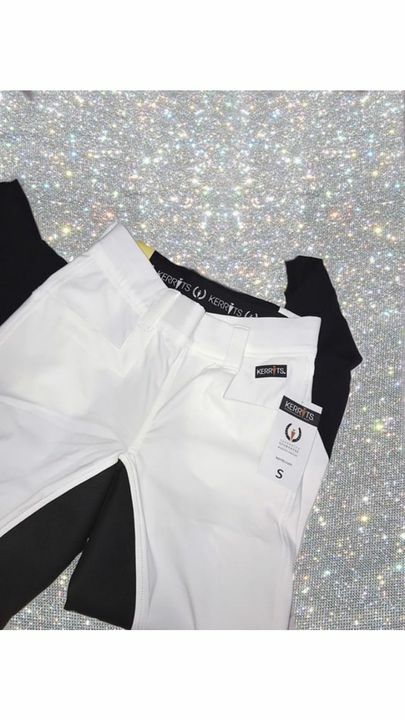 Just received my order and just wanted let you guys know that I am super pleased with the quality of these breeches! ❤️❤️✨Material is awesome for the hot humid weather in Hong Kong🔥! Already filling my cart for next order ! Love these breeches! Flattering and functional, and super comfortable to ride in. I love the super comfy stretchy fabric at the ankles/lower leg, they fit nicely under my riding boots and don’t cause any irritation to my skin like some elastic breech bottoms do. The jodhpurs fit very well although the white material is see through. I wear an 8 (sometimes 6, sometimes 10) in non-riding clothes, and I am 5' 6". The M are perfect.